Shaver, Clipper and Trimmer Set is rated 3.5 out of 5 by 55. The Signature 4-in-1 Gents Shaver, Clipper and Trimmer set is the ideal way to stay groomed whilst maintaining a busy lifestyle. 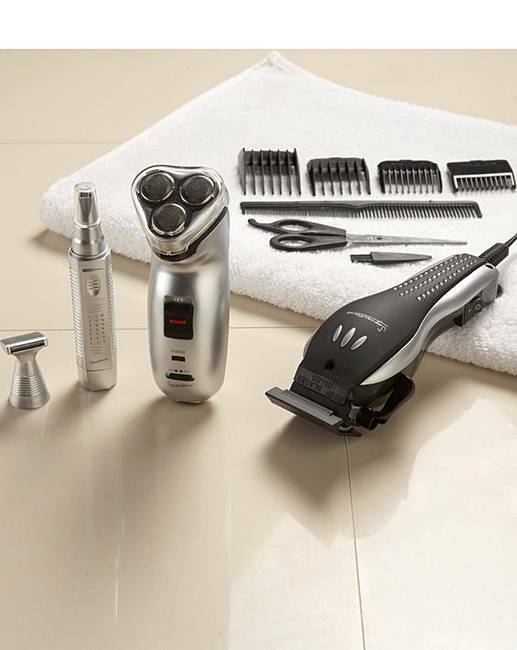 The set comprises of a rechargeable triple head shaver, salon-professional hair clippers and ear and nose trimmer. Rated 5 out of 5 by Tim3579 from Value for money I brought this item as it was good value for my money getting the various different items all together rather buying them all separate. Rated 4 out of 5 by Dapyso from Nice product I ordered it in December just to test, i am happy I did. Rated 5 out of 5 by Daisy from Bought this set recently This set was bought for a 16 year old young very much into his grooming and appearance he is absolutely delighted with and particularly the shaver which he says is brilliant!